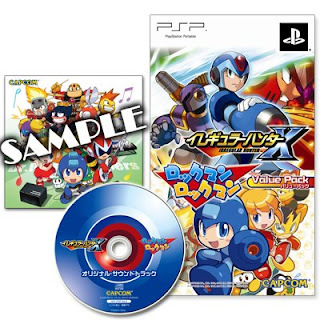 Well, here it is: the Irregular Hunter + Rockman Rockman Value Pack. According to e-Capcom, the bonus soundtrack is a limited time only deal, you know, a "available while supplies last" sort of thing. In any case, those fortunate enough to get a hold of the soundtrack will be treated to 30 tracks of IHX and RR music complete with bonus artwork. Unfortunately, it is unknown at this time if the soundtrack will be available through import outlets such as Play-Asia. I'll keep you posted! That album cover looks awesome! Oh god, please let us know as soon as possible. I want that soundtrack for the cover alone. They cared to make new artwork. Irregula Hunter? I think Protodude is turning into Ahnold Shvartzeneggah! Man....I hope you can get it from Play-Asia. If it's like other stuff, the first wave will have the CD, so if you preorder, you get it. But if it's like that last thing (forget what it was now) with the postcards, they only had 500 to give out, so even some who preordered didn't get them. Is this remixed or straight game rips? Man, that cover alone is enough reason to get it. I'm totally crossing my fingers that it'll be available through Play-Asia or something - I don't think my obsession with Powered Up could be satiated any other way! :P Oh, and MHX is pretty damn sweet too - the two-pack cover looks nice (far better than what we'd get anyway). I've never ordered from Play-Asia, are they like a direct seller? I'd hate to order it from them and not get the CD. I'd be really annoyed to find out they were taking the CD's for themselves and sending on only the game. I doubt they'd do that. When I bought the Japanese version of ZX (preordered) it came with the extra cd. I can't wait for someone to scan that cover. Hey any excuse for more super charming Powered Up official artwork! Hey, does anyone know if there's a track list to the soundtrack yet? Nothing yet. I'll let you know if something should pop up.